Our story in Thailand started in 2004 when key members of our design team were involved in design and management of refit project for 87' motor sailing expedition trimaran Long Ranger. Albatross Marine Design (AMD) is a Thailand-based design office founded by Dr. Albert Nazarov in early 2006. The company has grown rapidly and now provides services to worldwide clients. Current services offered include boat design, consultancy, construction supervision, engineering survey and projects management services. The present AMD office is one of, if not the largest and certainly one of the most productive design offices in the Asia Pacific region. With its extensive investment in the latest available design software and testing equipment it is without doubt one of the most advanced design offices in the world. The founder of AMD is Albert Nazarov who graduated in 1996 with a degree in Naval Architecture from the Faculty of Marine Technology and Shipping at the Sevastopol National Technical University. In 1999, he became a finalist in an international yacht design competition in the United Kingdom, and soon after he started his own boat design business. In May 2004, he received his Ph.D. at the Odessa Maritime Academy in subject of sailing craft controllability and performance. His research included acceleration tests of models of hull-keel combinations in a towing tank. This resulted in a new type of simulation software for sailboat non-stationary behaviour and manoeuvrability. He also studied art for 5 years which is an invaluable skill is the aesthetic design of boats, and enables him to quickly do realistic hand sketches to illustrate design ideas to clients. Albert is Member of Society of Naval Architects and Marine Engineers (SNAME), Fellow of Royal Institution of Naval Architects (RINA) and he is also a Chartered Engineer (UK). 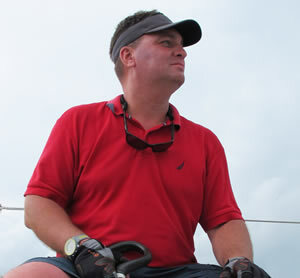 He has the Diploma in superyacht construction management from Maritime Training Academy (UK). Albert is boating enthusiast with wide experiences in sailing and power boating; he also has Yacht Captain Licence and IYT Bareboat Skipper certificate. Albatross Marine Design and its quality system are certified by the Russian Maritime Register of Shipping (RS). This certification authorizes AMD to provide design services for commercial and pleasure craft, high-speed craft, design of composite structures, construction supervision and to conduct of sea trials and testing of those craft. RS is one of 13 members of International Association of Classification Societies (IACS) together with Lloyds, Veritas, etc. and is an internationally recognized Maritime Authority. Most of AMD's designs are in the 30 to 50 foot range, with some in the 90 to 120 foot range with specialization on high-speed craft and catamarans. H48 catamaran yacht combines comfort, performance and stunning appearance. Builder - Bakricono Shipyard (Thailand). This boat is shortlisted as Significant Small Ship of 2015 by RINA. 8m class sailboat ‘Katran’ (design ‘Pluto800’) racing in Odessa (Ukraine); builder - A.W.L Yachting (Ukraine). Our flagship design - 90’ motoryacht ‘Golden Boy’ (design SB90) anchored at Ban Saray (Thailand); builder - S.E.A.T Boat (Thailand). AS14 unique rescue/ambulance aluminium catamaran built by Aurora (Russia). This boat is shortlisted as Significant Small Ship of 2014 by RINA..
Our fast interceptor craft design SM16 during demonstration at NAVDEX2013 show at Abu Dhabi (UAE); builder - Solas Marine Lanka (Sri Lanka). This boat is shortlisted as Significant Small Ship of 2013 by RINA. Boats designed by AMD are used for commercial operations and passenger transportation in Nigeria, Thailand, Philippines, China, Cambodia, Malaysia, India, Italy, Russia, Vanuatu. Albatross Marine Design works with boat builders in more than 10 countries in Asia, America, Europe and Australia. We also provide consultancy services for other design offices and shipyards around the world. By early 2015, almost 90 of our designs have been launched, many of them in series production. In total, we have developed 150 designs and concept designs. AMD’s sailing boat designs have crossed oceans and have had success in racing in different locations around the world. Several designs are currently in series production by discerning and reputable builders for world wide distribution and sales. For AMD, designing is an art, the aim of which is to develop functional outcomes that work within a pleasing appearance. It is not about creating a pleasing appearance that lacks practical function or performance. The success of the design process may be judged by the degree of compromise required in satisfying the above often conflicting requirements. Design is not just a visual presentation of a pleasing aesthetic structure, it is a complex solution of aesthetic, ergonomic and engineering tasks. In our practice, design means a complete and detailed set of plans, calculations and specifications with supporting documentation ready for the manufacturing process to begin. A design set from AMD is complete. The builder does not need to consider building aspects such as where the plumbing fits, or where the wiring runs, how to create stiffness where needed, or what lamination schedule is required. All of this is provided in the design set. We have wide experience in developing designs to ISO Small Craft standards and to other appropriate Standards or Rules of Classification Societies. Moreover, we work closely with certification agencies and have participated in the development, evaluation and adoption of a number of regulations, especially in field of high speed and small craft. We combine our artistic flair with a sound knowledge of engineering and ergonomic principles, experience of boat construction and years of seagoing experience. We design boats in different styles; classic and modern, practical and military. Our slogan is: We design elegant and practical boats for the sea, not just glamour toys for marinas. AT800 catamaran - our company boat extensively used not only for weekend recreation, but also for testing and measurements; builder - Aus Thai Marine (Thailand) and this is already the second boat we own from this builder.